I can appreciate the previous reviewers' comments centring on this retaining a certain pubby quality to it notwithstanding its keen focus on food. It is billed as a restaurant, yet the range and quality of Bath Ales' cask (and keg for those who enjoy that) can be enjoyed in a convivial, bustling environment. But I cannot be so positive with my experience of food - which you can feel free to ignore as it does date back a year or so but for some reason the original review has bitten the dust - but be wary, in case it was more than must teething troubles. We sat outdoors on a fine evening, having waited some while to place orders. The food did not come. It continued not to come, and despite more-than-timely reminders to various staff members, it still didn't materialise. When it finally did (verging on 90 minutes later) it was as I recall pleasant enough, but hardly world-beating. Perhaps expectations had been allowed to climb unrealistically high in the intervening hunger-ridden hiatus, but really, neither me nor my partner-in-palate-mongering felt that the wait had been justified by the standard of the food. 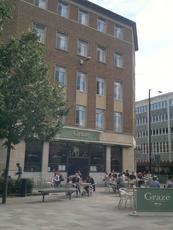 It was a real shame because we had led to be believed that Graze was not only a hip 'n' happenin' venue, but one which excelled in terms of its dishes. It was frankly a poor, provincial punt at a format which has been successful elsewhere, but also aped by those who have yet to quite master it. As I say, the ale was great, and priced sensibly which was a surprise. I just really hope that the above 2011 experience is now wiped clean by numerous more recent reviews regaling us with tales of fabulous food and splendid service. But for me, it has probably blotted its copybook indefinitely and I don't plan a return visit. A very pleasant Bath Ales pub, but quite different from the brewery's usual offering. Far more restaurant like, perhaps in keeping with its trendy harbourside location. But having drunk in there many a time (and never yet eaten) i've never been made to feel unwelcome for just wanting a pint or two of their delicious beer. Only downside is it can be quite noisy when its busy! Think of it as a restaurant where you are quite welcome to just pop in for a pint and you won't be disappointed.